Has the Palestinian issue reached a stage of a complete dismantling? Have the principles that governed it for long faded away in favour of other principles that set the stage for both new and perilous arrangements? Are we about to close the Palestinian cause through solutions based on imposing a de facto situation or external pressures? These questions do not come out of nowhere. There are several phenomena, transformations, and developments that give rise to such questions; such as the racist Jewish Nation-State Law, which the Israeli Knesset passed in July 2018. The law refers to Israel as a Jewish state or a state for the Jewish people, which carries serious implications regarding how Israel views the Palestinians and their rights, as well as the border of the state of Israel itself according to the Biblical Jewish perspective that speaks of the Greater Israel stretching from the Nile to the Euphrates. Further, there are several proposals that neglect the two-state solution and eliminate practically the establishment of the Palestinian state. This also includes the decision of US President Donald Trump to move the American Embassy from Tel Aviv to [occupied] Jerusalem, which has legitimated the Israeli control over the entire Holy City while occupied East Jerusalem is supposed to be the capital of the Palestinian state, a subject of discussion for many years. Moreover, the US administration has turned the two-state solution from an established and unquestionable principle of the Peace Process, since it was first launched in the Madrid Peace Conference in 1991, into an issue subject to the consent of both two parties, or more precisely to Israel’s approval. 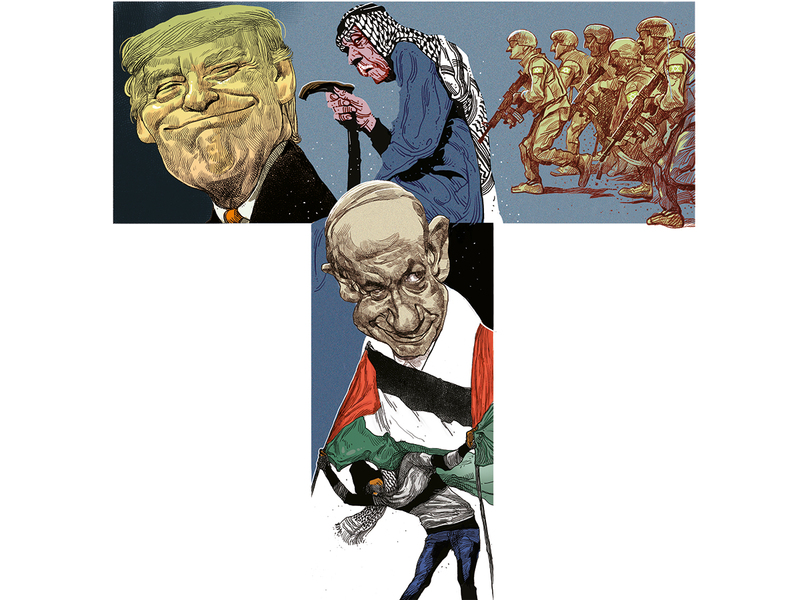 Furthermore, there are talks that Washington may deny Palestinian refugees’ right to return, an established right reiterated in the resolutions of international legitimacy on which the peace process is based. Additionally, Washington has stopped all forms of funding of the Palestinian National Authority and the United Nations Relief and Works Agency for Palestine Refugees in the Near East (UNRWA), and it has closed the Palestine Liberation Organisation (PLO) office in Washington. In addition, the Palestinian cause is no longer at the forefront of Arabs’ interests, as it used to be for long decades; it has sharply lost priority in light of the challenges, threats, and problems that face countries of the region, altering their list of priorities as well as their perception of threats to their national security and the position of Israel within these threats compared to other threats posed, primarily by Iran, Hezbollah, and terrorist groups, among others. Why did all this happen? How has the Palestinian cause reached this stage? To answer the question, it is necessary to trace the history of this cause, because there are deep-rooted, complex, and intertwined reasons that have brought the Palestinian cause, a central issue for Arabs, Muslims, and the entire world for long, to this stage. I would try to briefly list them in the following points. 1. As pointed out earlier, the causes are of long standing. In my view, the beginning of the collapse of the Palestinian cause was in 1990, when the Palestinian leadership, led by the late Yasser Arafat, committed a grave mistake. It made a decision I consider one of the most irrational and unwise decisions ever — to support the Iraqi invasion of the State of Kuwait, which was one of the strongest supporters of the Palestinian cause and the starting point to establish Fatah Movement and the PLO. Additionally, Palestinian leadership, under Israeli occupation, ought to be the last to support the occupation of any other country, especially if it was an Arab country. The unwise decision by the Palestinian leadership triggered serious consequences, at the top of which losing the Arabs’ unanimous support the Palestinian cause enjoyed before 1990. Palestinian leaders have undermined their case and caused division among the Arabs in this regard, at official and popular levels. Moreover, the Palestinian cause lost a great deal of support provided by GCC countries, and Palestinians became part of an Arab-Arab conflict, though they were once a subject of Arab consensus. 2. The second cause is that some Arab regimes have manipulated the Palestinian cause to serve their own interests, either by playing the Palestinian card in their relations with other Arab countries, seeking to assume leadership of the Arab world, or as a means to gain internal legitimacy. This was clearly manifested in the aftermath of the Egypt-Israel Peace Treaty in 1979 when countries such as Iraq, Syria, and Libya competed over the Arab leadership using their support of the Palestinian cause as leverage, raising slogans of confrontation, resistance, insisting on preserving Palestinian rights, and refusing peace as an option. Such speculations did not offer more than mere slogans that aborted several settlement opportunities at a time when Arabs were in a relatively strong position allowing them to exert pressure to obtain better settlement deals. However, every missed opportunity to settle this issue marked a regression in the Arab position. Consequently, the Palestinian cause reached the current situation with no margin for manoeuvring except for inappropriate and imposed solutions that reflect a serious power imbalance between Palestinians and Israel. 4. Internal Palestinian divisions. This is one of the most serious reasons behind the dismantling of the Palestinian cause and the distortion of its image at both the Arab and international levels, especially the split between Fatah and Hamas, the two major Palestinian forces. In 2007, Hamas resorted to armed force to take control of Gaza Strip; since then all attempts to bridge the gap between the two main movements have failed despite efforts exerted by several parties, particularly the Kingdom of Saudi Arabia and the Arab Republic of Egypt. In fact, numerous agreements between the two movements were not respected and were breached even before their ink had dried, including the Makkah Agreement in 2007, signed next to the Grand Mosque in Makkah under the patronage of late King Abdullah Bin Abdul Aziz Al Saud. This is in addition to other understandings reached under Egyptian auspices. Indeed, the division between Fatah and Hamas remains the most prominent on the Palestinian scene; yet, there are further splits resulting from a large number of Palestinian factions with different backgrounds. Every faction has its own foreign relations and ties with one or several external parties in a way that affects its orientations, decisions, and attitudes. Therefore, the Palestinian arena has become a centre of regional conflict, and a front to settle disagreements between many external forces, all at the expense of the Palestinian cause. All actors raise false slogans of defending the Palestinian cause and their claims are merely a big lie. The internal Palestinian division has distorted the image of the Palestinian cause among Arab, Muslim and international public opinion and has negatively impacted its moral content as a national liberation issue. This division has always allowed Israel to justify its refusal to abide by the principles of peace because of the absence of a single Palestinian party to negotiate with. Such a question has always been posed by international parties required to be engaged seriously in the peace process: whom shall we negotiate with Fatah, Hamas, Islamic Jihad or others? Does signing an agreement with Fatah guarantee it will be respected by Hamas or other factions? 5. There are those who regard the underlying reason behind the deterioration of the peace process to be Benjamin Netanyahu becoming prime minister of Israel for the first time in 1996, and his slogan “peace for peace” instead of the slogan on which the peace process of Madrid was based “land for peace.” However, I personally believe the situation to be much deeper. Undoubtedly, Netanyahu has adopted hardline positions against peace and the decisions of the Madrid Peace Conference; nevertheless, he clearly and publicly expressed Israel’s real strategic attitude. His predecessors adopted manoeuvres and twisted tactics to hide their real and ultimate goal, which is to completely liquidate the Palestinian cause. Since the Madrid Peace Conference, Israel has adopted a negotiating tactic based on two elements that have decisively contributed to putting the Palestinian cause on the path toward liquidation. The first is wasting time, so that negotiation becomes an end in itself and not a means to reach final agreements. In other words, negotiations for the sake of negotiations, since there would be no final dates in the negotiation process as was agreed upon at the Madrid Peace Conference. Israel has been fully successful in achieving this. Everyone has forgotten, over the years, the Madrid Peace Conference, its decisions, stages, and dates, and it has become part of history. The second element is imposing a de facto situation — to change the situation on the ground, whether through the large expansion of colonies, through the Judaisation of the city of Jerusalem, or even by dividing the Palestinian territories. Therefore, the Palestinian negotiator finds nothing to negotiate about with regard to the Palestinian land, the status of Jerusalem, or other issues that were supposed to be discussed in the final phase of negotiations, in accordance with the decisions of the Madrid Peace Conference. 6. One of the most important reasons behind the dismantling of the Palestinian cause is that international community and its main powers, which should guarantee the continuation of the peace process, its stages, and dates between Palestine and Israel. The USA, Russia, the European Union, and the United Nations did not assume their responsibility by exerting enough pressure on Israel to force it to abide by the agreements. Instead, they allowed Israel to back out of its commitments, break its promises, and manipulate the peace process until it has completely become meaningless. 7. The major powers that are supposed to be guarantors of the peace process share a great responsibility in the current deterioration of the Palestinian cause. These powers have not fulfilled their role in forcing Israel to adhere to the peace process. The USA, the main supporter of Israel, bears the greatest responsibility in this regard, because it has granted Israel protection over the past years in the United Nations and other international organisations. Now it introduces ideas for peace that are far from the vision of a two-state solution and eliminates all references on which the peace process has been based since the 1991 Madrid Peace Conference. It is well known that the USA is the only power in the world that can exercise real pressure on Israel, thus the only country that can make a viable and lasting peace. The dismantling of the Palestinian cause, regardless of its underlying reasons, entails serious and dangerous consequences. It will lead to a lack of confidence in the peace process as a means of obtaining Palestinian rights, thus encouraging violence and extremism as well as radical religious movements. This shall result in a threat to regional and global security and stability. The current liquidation of the Palestinian cause can pose further pressure on some Arab countries, primarily Egypt and Jordan, to accept certain formulas for settlement at the expense of their sovereignty, such as the proposal for the confederation between the West Bank and Jordan or the Deal of the Century, reported to be based on the exchange of land, the creation of a Palestinian capital on the outskirts of [occupied] Jerusalem, and other details far from the perceptions on which the peace process was originally based. Israel may think that the dismantling the Palestinian cause, annihilating it, and ending the two-state solution is all good for Israel. However, the truth is that Israel will face an existential threat in this situation because the end of the two-state solution will cause a serious problem. The one-state solution will resurface strongly, meaning the disappearance of the Jewish identity of the State of Israel because of the demographic imbalance in favour of Palestinians. The Israeli right-wing, which opposes the two-state solution and has worked for the complete annihilation of the Palestinian cause, presents a populist speech that satisfies its supporters and other hardliners, on the short term, but ignores the seriousness of the situation in the long term. All the above asserts that the Palestinian cause has become extremely ambiguous due to mixed internal, regional, and international views on it. In addition, peace, as a path to settle the cause, has declined; a lot of the givens that were part of it for decades have taken a blow; and US position toward it has shifted.